Summary: A new book by a public servant and academic highlights the top 100 black people who have made significant contributions to the world around them, past and present. NEW YORK CITY – Elliston Rahming had a mission: To find and highlight 100 black people from across the globe whose accomplishment was so significant and compelling that it helped advance, change, influence and impact the world for the better. The results of that search, from both the past and the present, can be found in his new book, released by Dog Ear Publishing. The accomplishments of those who are black have historically been underrepresented. For instance, although the Nobel Prize has been awarded to about 800 people since it began in 1901, only 14 honorees have been black, none of them scientists. “Greatest Blacks Ever: Top 100 Blacks Who Changed the World for Peace. Progress. Prosperity. Pleasure” aims to help fill in what Rahming calls a “black hole” of information about black innovators. The book showcases 10 people in each of these fields: human and civil rights, religion, inventions, sports, education, arts and entertainment, business and entrepreneurship, politics and governance, science and technology, and communication and media. The people who qualified for inclusion in the book were chosen first by a multidisciplinary panel of academics who passed 15 names for each of the fields to a second panel of multiethnic judges for the final selections. Those selections include well-known names such as Harriet Tubman, Madam C. J. Walker, Nelson Mandela, Saint Augustine, George Washington Carver, Pelé, Michael Jackson and Neil deGrasse Tyson. The book also highlights lesser-known figures, such as Ann Nzinga, a sixteenth-century queen of Angola; Patricia Era Bath, a U.S. ophthalmologist who developed a probe used in treating cataracts; Philip Emeagwali of Nigeria, known as the Bill Gates of Africa, who invented the world’s fastest computer; and Mo Abudu of the United Kingdom and Nigeria, named Africa’s most successful woman by Forbes Magazine and known as the Oprah Winfrey of Africa. Beyond serving as a collection of short biographies about successful black people from around the world, the book aims to bring a new perspective about the impact one person can have. “The richness of the legacies created by the people in this book should awaken a curiosity in each of us, regardless of race or country,” writes television personality Montel Williams in the book’s forward. 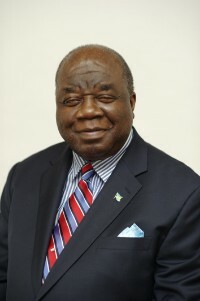 Elliston Rahming has served as an ambassador at the United Nations and the Organization of American States in Washington, DC. The distinguished public service worker and academician has masters and doctorates from Washington University in St. Louis and a bachelor’s degree from Bethune- Cookman University.